Get the high stretch needed to absorb the shock loads caused by harbor surges and boat wakes. Boater Sports 3-strand twisted nylon dock lines are manufactured using a 4-stage construction and 100% premium nylon fiber, producing an extremely well balanced line for maximum strength, increased flexibility, and superior abrasion resistance to counteract chafe. 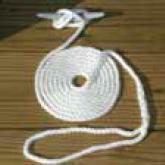 Professionally spliced 12" cleat loop with six full tucks and heat sealed ends.